Adventures with Max are phenomenal, well-written, well-played, well-dreamed, and well-filmed. Ordinarily, book-to-film adaptations lack depth and intrigue. This film, having no more than 10 pages to work with, however surpassed my every reading of this book before. Little Max gave an astounding performance. I could feel his pain, understand his loneliness, sense his sorrow, and at the same time, he made me more resilient with his every battle cry! 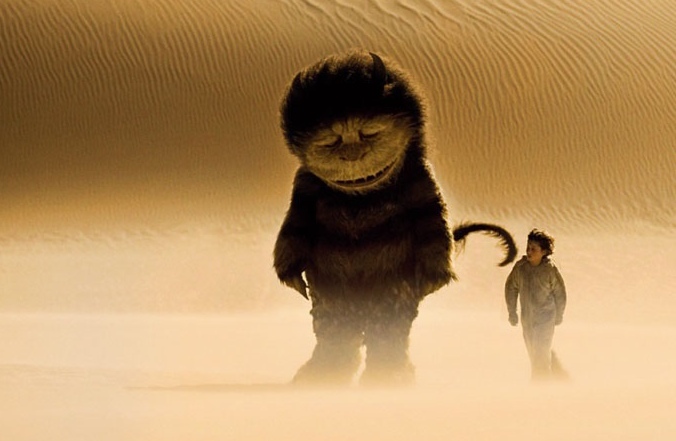 Henson’s monsters ala Sendak spoke candidly, played violently, felt intensely. Each highlighting and honing in on an aspect of the boy’s internal sensibility, became a kalidescope of kid-sized reactions and thoughts. The new “family” made him their king and asked if he in his power could take away the sadness and loneliness. 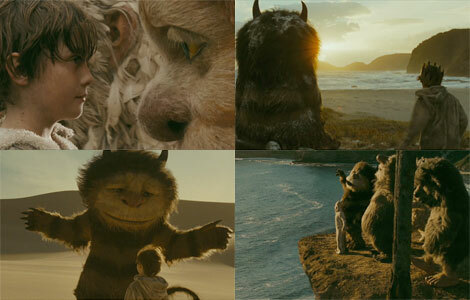 His response became the backbone of the film, “I have a sadness shield and I take loneliness and do this…kapkooo!” King Max grew up over his short season as king of the Wild Things, learning how to deal with his inner termoil and how to love his family again. Saying goodbye, Max sailed back across the sea to the perfect sound track by Karen O and the Kids. So, let the wild rumpus begin!